Aaron Ekblad is the best defenseman available in the 2014 NHL Draft class. He’s really, really good. 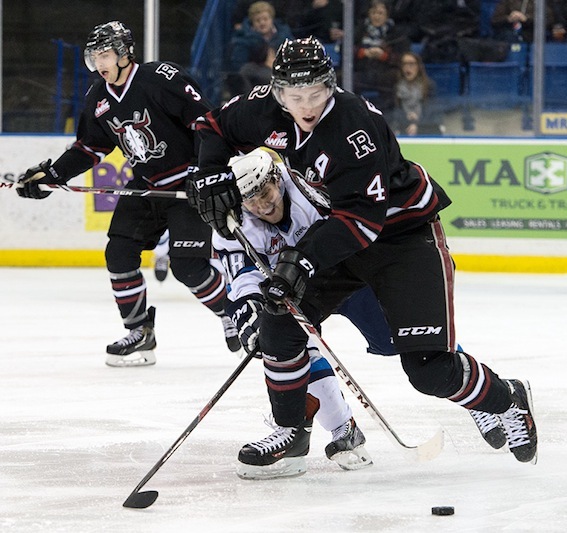 Red Deer Rebels blueliner Haydn Fleury is likely the next-best defender available. You could describe Fleury in many ways as the poor man’s Aaron Ekblad without really disparaging either player. Like Ekblad, Fleury is a big, rangy defender. He’s got a big frame and is strong, but can still fill out. He’s not a sniper by any stretch and can probably improve his offensive instincts a bit, but still contributed 46 points for the Rebels. And he wore a letter for Brent Sutter’s club, which speaks volumes about his leadership potential. In a nutshell, Haydn Fleury is a defenseman’s defenseman. He uses his size and speed well to keep defenders to the outside. His skating is good, but not great, but he’s a smart enough positional player that it hasn’t mattered. He’s physical, but not overly aggressive and his judgment – in terms of going for the body or pinching – is generally pretty good. His decision-making might need to be a bit quicker at the pro level against faster and bigger guys, and he could probably continue to develop a bit of a mean streak for the same reasons. Fleury is pretty good already, yet still has a ton of potential. He’s got the ideal NHL frame and can likely fill out into the prototypical NHL defenseman’s body – big, strong and fairly fast for a big guy. The key thing going forward will be for him to continue to progress and work on the little things in his game. He’s not quite as NHL-ready as the incredibly-gifted Aaron Ekblad, but Fleury is very well-rounded and outside of his no-frills offensive game, he doesn’t have a weak spot in his game. Fleury represented Team Western Canada at the World Under-17 Challenge, and was part of Team Canada’s at the Ivan Hlinka Memorial Tournament and the U-18 World Championship. He won gold at the Ivan Hlinka, and bronze at the U-18s, where he was named the tournament’s Best Defenseman. A really good second-pairing defenseman. Uses body well, in terms of long stride and long reach. Developing as a leader in Red Deer. Could add a bit of aggression or meanness to his game. Instincts in offensive zone could use a bit of work. First stride could be improved to get him up to speed faster. Ben Lovejoy has a similar frame and body-type, but Fleury is better at this point of his career than Lovejoy was. In terms of defensive skill, Marc-Edouard Vlasic is a better comparison. Fleury will go sometime in the first round.